Thank you for sending the 28 questions related to residential land. We set out below our responses to the questions. Because the questions you have posed are in the context of the other narrative, we have included that narrative as well as the questions (both in blue typeface) below. Our responses to the questions are in black typeface. In some cases we do not believe that EQC is the appropriate entity to respond to the question – and we have indicated where this is the case. The increased height of the groundwater table can be observed by comparison between maps from the Orbit geotechnical database, information from GNS science, Ecan and the recent map published by EQC for IFV from Chapman Trip and Tonkin and Taylor. 1. How does EQC calculate land damage caused by the post-earthquake rise in groundwater levels? The effect of shallower groundwater is potentially a thinner non-liquefying crust. Where there has been a material increase in liquefaction vulnerability caused by the Canterbury earthquakes, this is addressed by the Increased Liquefaction Vulnerability (ILV) land damage assessment. Further, the effect of being at a lower height relative to sea level is potentially an increase in the flooding vulnerability of the land. Where there has been a material increase in flooding vulnerability caused by the Canterbury earthquakes, this is addressed in the Increased Flooding Vulnerability (IFV) land damage assessment. 2. What height of groundwater in coastal areas defines land at risk of imminent loss? The Earthquake Commission Act (EQC Act) defines “physical loss or damage” to include any physical loss or damage to the property that (in the opinion of EQC) is imminent as the direct result of a natural disaster which has occurred.  that the damage will happen soon. EQC generally uses a maximum time frame of one year from the date of the natural disaster as a useful rule of thumb for “imminent”. This period allows for all of the seasons, and likely weather conditions, to pass. It is now well over a year since the last of the land damage-causing Canterbury earthquakes. Accordingly the period in which “imminent loss” as a result of the earthquakes could have been identified (or been confirmed as having occurred) has now past. 3. How will increased groundwater height be calculated for IFV? The flood modeling assumes that the groundwater level is now closer to the surface, by the same distance as the ground has settled (e.g. if groundwater was at 1.0m depth before the earthquake, and the ground settles by 0.3m, then the post-earthquake flood model assumes groundwater at 0.7m depth). The flood model keeps track of the rise in groundwater level as rainfall infiltrates into the ground (this is related to the soil types), and when the groundwater level reaches the ground surface, no more infiltration is included in the model. The model is based on the 85th percentile groundwater level (i.e. 85% of the time the groundwater level will be lower than assumed in the model, so there is a low likelihood of having a higher groundwater when a large rainfall event begins). Another issue is the temporary stop banks along the Avon river. These were installed by Council as an emergency response to the subsidence of land after the earthquakes. These temporary stop banks and are not up to infrastructure standard. They do not provide protection from erosion or the intrusion of saline groundwater. In essence, they merely serve as a temporary solution allowing residents to retreat from these areas. The answers provided previously regarding these stop banks and their upkeep have reflected the same attitudes. CERA continually points the finger at the Council proclaiming this to be a council’s responsibility, the Council proclaims this to be the responsibility of SCIRT, while these temporary stop banks continue to erode away and have now become a danger to the local community. The recovery authorities installed these ‘emergency temporary solutions’ when an area-wide solution was the only feasible immediate emergency solution to this problem. However, since the installation of these ‘emergency temporary’ stop banks, (4.5 years ago), there has been no attempt by authorities to install permanent, secure and guaranteed durable replacements, which would ensure citizen safety. Insurance companies are now avoiding these areas and are only providing insurance until claims are settled. In cases where insurance is offered, it excludes provisions for flooding and subsidence. Some properties are only being offered insurance on a month-by-month basis. Properties being rebuilt are subject to hazard notices.  According to a presentation given by Malcolm Alexander LGNZ for the Insurance Council, a hazard notice can reduce the value of a new property by 50%. EQC does not provide cover for flooding caused by storm events. Some insurance companies are now refusing to provide fire insurance. 4. How does EQC factor in the DOV because of hazard notices and the uninsurable risk? The general location and whether or not other desirable features such as water views “soften” the impact of any flooding. Exercise valuation judgement as to the resulting DOV – The valuer makes a final check to ensure the reduction in value determined for the property is appropriate as a matter of valuation judgement. If a customer has any further information relevant to a DOV assessment (arising from ILV or IFV damage), then the customer may request a review of that assessment. Further, the DOV Methodology for IFV damage includes an assumption that insurance will be generally available to properties with IFV damage, other than in the most extreme cases (for example, where the tidal impact on a property has changed to the extent that causes the property to flood regularly). EQC’s valuers will take into account these extreme circumstances in assessing the DOV for IFV. 5. How are the recovery authorities going to ensure that all “green zoned” properties continue to be provided with insurance cover? 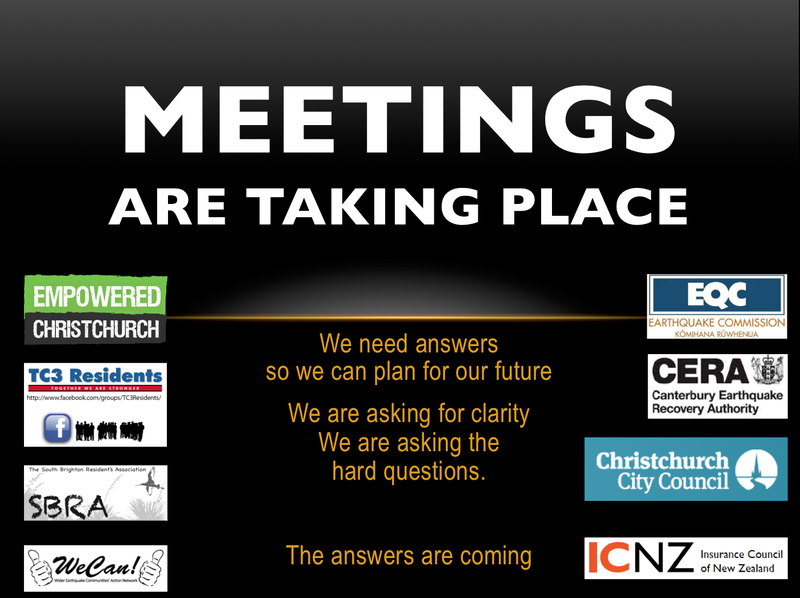 This is not a question for EQC. 6. Is the management of the earthquake recovery being done in this order to allow insurance companies and banks to retreat before the risk is widely recognized? 7. Is it permissible under statutory obligations to leave fully insured residents bearing uninsurable risk following a disaster (imminent loss)? Cabinet ministers based zoning decisions on the assumption that individual solutions were available for all land that had been zoned green. The Earthquake Commission has now stated that no individual solutions are, in fact, available for properties that are at increased vulnerability to flooding (IVF category). The logical conclusion from this is that the zoning decisions were based on incorrect assumptions and that the land in question is damaged beyond repair (a total loss). 8. It has been confirmed: There are no solutions available to reinstate properties to pre-earthquake values and placement, in the areas where land is close to the high tide mark and ground water is at a dangerous height as a direct result of the recent seismic even How does EQC intend to deal with this situation? In accordance with the Land Declaratory Judgment, EQC has recognised IFV and ILV as forms of land damage that are covered under the EQC Act. EQC would prefer to settle land claims with these types of damage by providing a cash payment based on the amount it would cost to repair or reinstate the land. However, it may not be possible in some cases to identify a repair method to the land which is feasible and able to be done legally. EQC proposes to use DOV as a settlement option for these types of land damage in appropriate cases. The High Court Declaratory Judgment confirmed that DOV is a lawful settlement option. DOV for IFV is assessed taking into account the change in flooding vulnerability to the particular property. The DOV Methodology for IFV Damage sets out a matrix that will apply in the majority of cases. However, it also notes that if the impact is particularly severe, the property will be treated on merit. The basis of the CERA zoning is not a question for EQC. The Stage 3 Land Report published by the Earthquake Commission is misleading. Amongst other things, the report states: ‘The average land elevation in South Brighton is 1.7 m above sea level and groundwater is at an average height of 1.3 m from the surface’. However, measurements clearly show that elevation is below the high tide mark and that groundwater is as high as 10 cm from the surface. This water is proven as being both saline and tidal. All the maps published are dated June 2011. These exclude damage from the December earthquake 2011. According to information presented by Tonkin and Taylor in San Francisco 20,000 properties suffered damage at that event. Please explain your reasons for this obvious exclusion. 9. Does EQC plan to withdraw this misleading document? EQC does not plan to withdraw this report. The information in the suburb summary factsheets in the Stage 3 report is correct, and provides an indication of the typical range of performance observed on residential properties across the suburb of South Brighton. If readers of the report are interested in the land and groundwater elevation specific to their property (or non-residential land such as the Bridge St Reserve), then they can refer to the maps included in the report for more detail. 10. When will EQC update the maps and correctly inform the public of the ‘true situation’ and the true extent of the post-earthquake land damage to their properties? Tonkin & Taylor has confirmed that these maps and this report are correct and do not need to be updated. The Tonkin & Taylor Stage 3 report was published in July 2012, and includes the December 2011 earthquake and its significant aftershocks. The maps in the report are dated June 2012 (not June 2011). The report explains that the liquefaction in June and December 2011 was less than February 2011, and caused an incremental increase in the same kinds of damage as observed after the February 2011 earthquake. Empowered will seek further clarifications. DOV settlement of land damage is, in our opinion, an unacceptable approach in these instances unless EQC erects flood protection that is proven to be durable, sustainable and up to infrastructure standard − in other words area-wide mitigation − as it is proven that these affected properties are at risk of imminent loss. 2,000 properties have been identified as having no practical repair possible. This represents a total of 7,000 properties. 11. When will EQC communicate this to the affected residents? These figures were estimates only, based on the trends observed over the region, not property- specific evaluations. These figures are no longer current and therefore will not be communicated to affected residents. The estimates continue to change as more detailed regional analysis is undertaken and ground remediation technology continues to develop in Canterbury. Once property-specific ILV assessments are completed, customers will receive an information pack that explains the basis of the ILV settlement for their specific property. EQC has already informed customers who may potentially qualify for ILV. 12. As EQC refuse to provide any land remediation and council will not inspect or issue consents for the home owners proposed remediation to their land, who is liable if the proposed remediation fails? If a homeowner elects to undertake land remediation, they would typically engage an engineer to design and supervise the work, and a specialist contractor to construct the ground improvement. Signoff and liability for the work will depend on the provisions of the contractual arrangements between the homeowner and the engineer, and the homeowner and the contractor. 13. EQC has already identified and published these facts and have failed to meet publicly promised deadlines. When will EQC release the people affected whose lives have been on hold for four and a half plus years and when do EQC propose to finally settle the land claims? Communities have experienced more than enough trauma. When will the EQC / Council and CERA omissions cease? When will land owners be truthfully informed, and offered alternative options to relocate or options of proven tested guaranteed durable re-insurable remediation, which will finally assist to ending this man-made suffering bought on by inept policies and procedures which year to date have all failed? EQC has begun settling claims which include IFV land damage and expects to have completed the majority of these settlements by early 2016. Land claims which include ILV land damage will start to be settled once the ILV Policy is finalised. This is expected to occur in September 2015. This means ILV claim settlement is likely to continue during 2016. It has been identified that CER Act instructs the recovery authorities to address the NZCPS. Most coastal areas were omitted from the zoning decisions. People have been left facing an unacceptable risk. 14. When will this be addressed? 15. People who have already settled their insurance claims in some of the worst affected areas are likely to face a total loss. How will this be compensated? 16. What is the timeframe for this long-delayed phase of the recovery? LSN, Tonkin and Taylor have invented a new approach to identifying liquefaction vulnerability that takes even less consideration of groundwater and non-liquefiable crust thinning. It identifies land that has sunk over a meter and suffered lateral spreading over a metre as not being vulnerable to liquefaction. Please note: The drilling rig sank into the ground at one property on the edge of the Avon River. The home is below high tide and groundwater has been measured at 10 cm from the surface. Report No. R12/83″ “GNS Science Consultancy Report 2012/218 September 2012- FINAL December 2012″ CERA rejected the TC zone part of this report when it was presented. 17. What was wrong with the previous reports drawn up by GNS Science, What was the reason for CERA to reject this report for the TC areas in Christchurch? 18. What was the objective of inventing a new method that is neither tried nor tested? It is more sensitive to changes in the thickness of the non-liquefying surface crust, so is better able to measure changes in liquefaction vulnerability due to ground subsidence. The LSN has been developed based on one of the most extensive databases of subsurface testing and earthquake observations ever assembled; and has been peer reviewed by an international expert panel of some of the most respected researchers in the liquefaction field. The LSN does take into account (and place significant weight on) groundwater levels and non- liquefiable crust thinning. 19. How much tax payers money has now been spent relentlessly trying to source cheaper reinstatement options, and resulting in negative results. Would monies be better spent, reinstating with already tested / proven procedures? Existing liquefaction vulnerability measures would have suggested that there was less change in vulnerability than where the LSN has been applied. Fewer properties would have qualified for ILV if LSN had not been developed. Further, EQC has invested a considerable amount in investigating ground improvement techniques for properties with ILV. As a result, several techniques have been simplified and made less costly. This work will be of benefit to customers wishing to undertake ILV repairs. The information on the Ground Improvement Programme undertaken by EQC, in conjunction with international partners and private insurers, will be publicly available later this year. 21. How do the two different methods GNS Science versus Tonkin and Taylor compare in practice? The GNS report does not assess ILV. It only identifies geological areas where geotechnical investigations for liquefaction assessment are needed for new subdivisions. 21. How will EQC evaluate liquefaction vulnerability, land subsidence vulnerability and Lateral Spread vulnerability? Liquefaction vulnerability is assessed using the ILV assessment methodology developed by Tonkin & Taylor and peer reviewed by an international expert panel of some of the most respected researchers in the liquefaction field. Land subsidence is a form of liquefaction damage, and therefore any increase in vulnerability to liquefaction-induced subsidence is taken into account in the assessment of ILV. Changes in the land due to land subsidence are also assessed using the IFV assessment methodology. Damage caused by lateral spreading is compensated by EQC as Category 1 land damage (or ‘visible’ land damage, as it is sometimes called). No increase in lateral spread vulnerability has occurred. 22. The TC 2 and 3 categories are a definition of liquefaction vulnerability. Will this be reflected in land claim settlements? The TC categories are an indicator of the level of geotechnical investigation and specific engineering design required for repair and rebuilding of foundations. They are not a site-specific definition of liquefaction vulnerability. The assessment of a land damage claim by EQC is a process separate from the decision that was made on the Technical Category of the property, e.g. TC1, TC2, TC3. For example, the ILV assessment is based on the technical data relevant for each individual property, and the TC does not influence this assessment one way or the other. 23. CERA has referred to a budget of $2.5bn for land claim Has this changed? This is a question for CERA. 24. Will all land that has been subject to DoV payment but no remediation still enjoy full EQC coverage into the future? In general, if an EQC customer has valid fire insurance with a private insurer then the property is covered by EQC. A customer confirmed as having suffered IFV and/or ILV damage should discuss with their private insurer whether their future insurance is impacted by the land having that damage. 25. How many properties does the modeling show will receive maximum entitlement ..i.e the market value of minimum lot size. We do not have a precise number. Ascertaining the answer is made more complex by the fact that some properties (yet to be determined) will have more than one type of land damage – i.e. IFV, ILV , Category 1 to 7 damage and/or damage to structures (retaining walls, bridges and culverts). 26. Given that it will be 5+ years since the first event, will any payments be calculated on current market values? Regarding the assessment of DOV, see the response to Question 4 above. Where market value is relevant in the “cap” calculation, the assessment of the value is to be immediately prior to the occurrence of the damage. However in some circumstances, EQC adopts a fair market value where the market value as at that time is not able to be assessed (e.g. because there was no market) and where it is necessary to remove distortions resulting from the earthquakes. 27. What progress has EQC and its agents made on remediation strategies for ILV land? Considerable progress has been made and the Ground Improvement Programme Report will be published later this year. 28.Considering that EQC has a precedent of settling imminent loss claims within 90 days in the past. What law instructs this precedent not to be implemented in Christchurch? 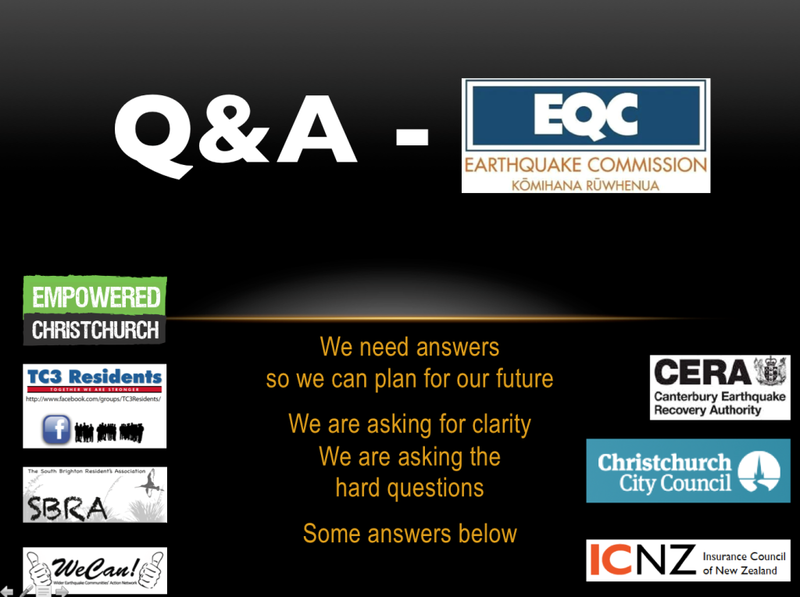 See the answer to Question 2 on how EQC deals with imminent loss claims. Next meeting is scheduled 28 August. CERA will provide some of the missing answers. They will be added here, once received . This entry was posted in Publications & guides, Resources. Bookmark the permalink.